How Many Of These 6 Breakfast Eateries Have You Ticked Off Your List? They say breakfast is the most important meal of the day – and we tend to agree. After all, kick-starting your day with a great meal sounds pretty sweet, doesn’t it? Here are 6 of our favourite spots for a ‘breakfast of champions’. Earlier this year, Fat Cat’s Cafe in Wanowrie introduced an all-new breakfast menu, as well as an earlier opening hour (8.00 am). The spread includes eggs (sunny-side up, scrambled, and stuffed omelettes) served with toast-butter, sausages (chicken or pork) or hash browns; breakfast sandwiches, pancakes, smoothies, and desserts. We’ve tried their fluffy ‘ooh la la’ omelette – stuffed with tomatoes, ham and cheese, two toasts, and two juicy-fried pork sausages – which was just divine; and their ‘churro pancakes’ which are as indulgent as they sound. We also recommend their ‘bring it on’ breakfast sandwich, made with grilled brown bread, home-made hummus, onions, olives, and feta; and the ‘Monte Cristo’, which is a sandwich filled with mustard, mayo, and cheese slathered between two slices of French toast. Need we say more? We also recommend you ask for their daily specials – as there’s almost always something new to try at Fat Cat’s! Newly opened ‘The Bawa Cafe’ in Viman Nagar serves an all-day breakfast (in addition to their regular fare) in true Parsi style – with 17 types of eggs (we counted), as well as sandwiches, waffles, and pancakes. When we visited them recently, we ordered and loved their traditional ‘akuri’ (Parsi-style egg bhurji) and think you will, too. Other egg preparations we recommend you try, would be the ‘Parsi poro’ masala omelette, the ‘Eggs Kejriwal’ (no relation to the politician), ‘bheja par edu’ (mutton brain on eggs), and our childhood favourite – ‘salli per edu’ (eggs on finely shredded fried potato). A quiet bungalow tucked away just off lane 5 in Koregaon Park, The French Window Patisserie is a nice place to grab breakfast. Choose from eggs-to-order to freshly baked croissants, Parisian-style Eggs Benedict, eggs on toast, pancakes (classic, and a healthy nachni-oat option as well), porridge, and granola bowls are available from 9.00 am, until 12.30 pm. For those who take their breakfast game seriously, we suggest trying their classic Parisian Eggs Benedict – a butter croissant served with poached eggs, smoked salmon, topped with Hollandaise sauce; while dessert lovers could partake in the apple-pie pancakes, and meat-lovers could enjoy their cheesy ‘meat-fest’ omelette with a side of toast and some salad leaves. Caffeine addicts will also appreciate their manual-made brews here, available in aeropress, French-press, and pour-over. One O Eight may be an all-vegetarian Cafe, but what they lack in meat they certainly make up for, with flavour! Early risers will appreciate their opening time, and the choice of eats to start your day with. Breakfast bowls, eggs, veg preparations, and sides are available all-day; as are their delicious range of fresh cold-pressed juices (pink ginger is our fave) and fresh-brewed coffees. We’ve tried nearly everything on their breakfast menu, and recommend you order the ‘big breaky’ (eggs made your way, with sides of roast veggies, hash browns, sweet chili sauce, and whole wheat toast), and the Croque Madame sandwich (made with brioche bread, gruyere béchamel, spinach, gruyere and mozzarella cheese, topped with a fried egg). Lighter options we love, include the smashed avocados on toast (topped with feta, lemon, olive oil, cherry tomatoes, and almond dukkah) and the ‘mushrooms on baguette’ (olive tapenade with sautéed mushrooms, feta, and rocket leaves). For something sweet, we suggest their house-made ricotta pancakes, with fresh seasonal fruit and spiced sugar syrup (gluten-free and egg-less options also available). #LBBTip: They’re relocating to another venue in Koregaon Park shortly, so keep an eye on their Instagram feed for all the latest updates. Also an early-bird joint, The Flour Works in Kalyani Nagar opens from 7.00AM every day, with a European-American breakfast menu. Satiate your hunger with their 10 types of Eggs Benedict, eggs-to-order or stuffed omelettes, waffles/pancakes/French toast with 4 varieties of toppings (each), or go the healthy route with their diet-friendly options (muesli, granola, scrambled tofu, etc). 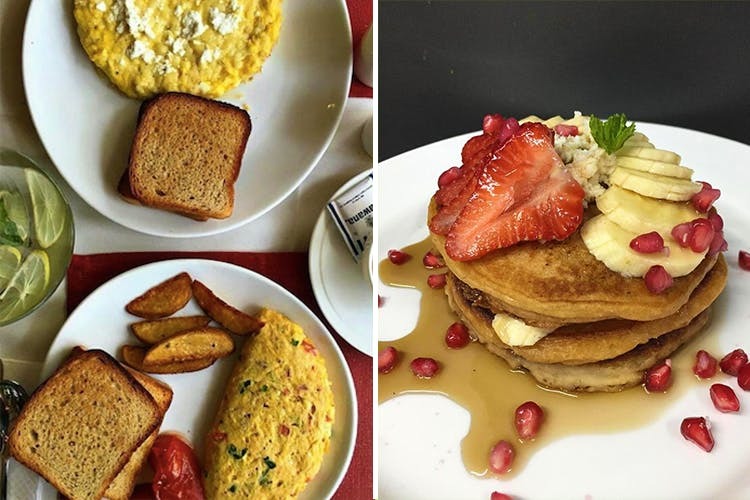 Our favourites here include their light-and-fluffy pancakes with fresh fruit and honey; their mushroom-and-leek omelette, and their spring onion-and-bacon omelette (served with toast, potato wedges, and garlic tomatoes). Each serving is filling enough to put you in a food-coma, so choose wisely! Recently relocated to Viman Nagar, Dravida’s Bistro is one of our favourite spots for authentic South-Indian breakfast. Open from 9.00 am onwards, you can DIY your own dosa, idli, or paratha combos here – with the size, base, fillings, and condiments of your choice. It’s pretty novel, and we love having this option, which really breaks the monotony of choosing the same standard items that are so easily available elsewhere. Staple favourites here are the mini-idlis with podi, the benne dosa, and the Mysore-masala dosa. Wash it all down with a fresh juice or smoothie, and you’re good to go! Dravida’s Bistro is an all-vegetarian eatery, and we recommend their South-Indian fare to anyone who’s looking for an authentic home-style meal at affordable prices.